I am sure most of you would be using Windows 7 by now. Its one hefty upgrade from XP (Vista doesn’t count :D). One thing which I miss the most is the TweakUI plugin. It was a nice little app which lots of features to customize your Windows Experience. One of them was AutoLogon. What basically it used to do was, in Windows when you have enabled the Welcome screen (enabled by default), and if your Windows have only one user account then it directly boots to the desktop but as when you have multiple users, the Welcome screen starts showing up on boot. This gets irritating mainly for developers and IT pros, as they create accounts for various apps. Like I had to create a user with sufficient privileges for SQL Server. If you have multiple users and do not want the boot to stuck up on Welcome screen then follow this simple trick for Windows 7. When the Automatically Log On dialog box appears, enter the user name you wish to automatically login to Windows 7 with. Then enter your account password in the two fields where it’s asked. Click OK on the User Accounts window to complete the process. From now on, when your PC starts up, Windows 7 will logon automatically. You all must have heard of Windows 7 by now, and also heard of ‘rave reviews’ about it. Windows 7 truly is a great product which does what it says ‘Your PC, Simplified’. 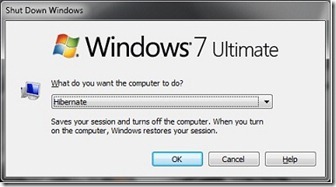 You can read my blog entry ‘Windows 7 : Just GO for IT!! !‘ to know more about Windows 7. With every version of Windows comes a new set of Tips and Tricks which allows you to get the most out of your Windows. Infact, its this little feature which makes Windows so lovable, the ability to ‘customize’. And Windows 7 has loadzzz of them to offer. Here is one of them. In Windows XP enabling Hibernate option was a very easy task, but we have to follow a different approach to do the same job in Vista and Windows 7. If you are not aware of Hibernate feature, Hibernation is a power-saving state designed primarily for laptops. While sleep puts your work and settings in memory and draws a small amount of power, hibernation puts your open documents and programs on your hard disk and then turns off your computer. Of all the power-saving states in Windows, hibernation uses the least amount of power. On a laptop, use hibernation when you know that you won’t use your laptop for an extended period and won’t have an opportunity to charge the battery during that time. 1. Open Command Prompt with Administrator rights. To open Command Prompt, type CMD in Start menu and then hit Ctrl + Shift + Enter to open the Command Prompt with Admin rights. 3. Type exit and hit enter to close the Command Prompt. A. Type Power Options in Start menu and hit enter. B. 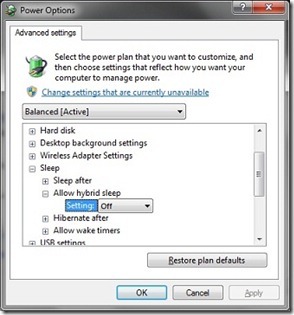 In the left pane, open the link labeled “Change when the computer sleeps” and then open the link “Change advanced power settings”. C. Under the Advanced Sleep options, expand the Sleep tree and turn off Hybrid Sleep. D. Now go back to Start menu to see the new Hibernate entry. You probably needs an introduction to Windows 7. Everybody just knows what a great product it is. But I guess a very few would be knowing that Microsoft was holding up a Windows 7 Coding contest in which developers all around the world had to code a windows application focusing on prominent Windows 7 features. So i followed it just to see what others can do. And by far, I was impressed. The creativity of some people have just baffled me. He uses the webcam and interacts with his finger, like when he closes them, it counts a click and when he closes and drags them to make the page slide up and down. AWESOME!! Have a look at some of them and many would surely be impressed. Windows 7 : Just GO for it!!! Yes really !! What Michael Dell ( i hope that name rings a bell, atleast the second part 😀 ) has been echoed by a number of other people who are all praise for the new horse from the Microsoft stable. Just give a search on Google or Bing and you will articles on various websites showing you how “awesome” Windows 7 is. Windows 7 offers a lot of various improvements over the previous versions of Windows. It just doesnt stop there, it offers a lot of new enhancements and features which is surely going to make your daily computing easy and efficient. Lets have a look at some “prominent” features of Windows 7. Sure, the new Windows 7 taskbar is still the same familiar place for switching between windows. But now it’s easier to see, more flexible, and more powerful. For instance, in Windows 7 you can “pin” favorite programs anywhere on the taskbar for easy access. Not crazy about the icon lineup? Now you can rearrange them any way you like by clicking and dragging. Finally, there are new ways to preview windows. Point to a taskbar icon to see a thumbnail preview of open files or programs. Then, move your mouse over a thumbnail to preview the window full-screen. You can even close windows from the thumbnail previews—a big time saver. The Jump List feature is designed to provide you with quick access to the documents and tasks associated with your applications. You can think of Jump Lists like little application-specific Start menus. Jump Lists can be found on the application icons that appear on the Taskbar when an application is running or on the Start menu in the recently opened programs section. Jump Lists can also be found on the icons of applications that have been specifically pinned to the Taskbar or the Start menu. Jump Lists on the Start menu will appear a little different than Jump Lists on the Taskbar. However, they will provide the same functionality. By default, the Jump List can contain the application’s shortcut, the ability to toggle pinning, the ability to close one or all windows, access to specific tasks associated with the application, and once you begin using the application, a list of recent documents or destinations depending on the application. Windows 7 adds a fantastic feature called as Aero-Peek. It allows you to peek or preview a window or your desktop by simply hovering over the respected icons. Windows 7 then creates a visually appealing transparency effects to show you the window which you want. Click on the image above to enlarge and see the difference between and understand what Aero Peek does. The above image is another example of Aero Peek. Can you see those shaded borders behind the Internet Explorer Window? Well they are actually windows themselves but they have been made transparent temporarily as you are in the Aero Peek mode. HomeGroup – Networking made eaaaassyyyyy. Ever wanted to share your music, pictures and documents within your home computers and found the task to be difficult? HomeGroup in Windows 7 will simplify the tasks associated with sharing music, pictures and documents within your home network and Windows 7 PCs. HomeGroup also allows you to share your USB connected printers, if you have a printer in the living room that’s shared by HomeGroup it will be automatically installed onto your other HomeGroup enabled PCs. Domain-joined computers can be part of a HomeGroup too. Microsoft is seriously going heads and tails to get Windows 7 on your PCs. Its offering humongous discounts on it and here is the latest one. If you are a US student then check this out.. If you are a UK student then check this out..
Go enjoy !! and if somebody decides to get it.. Please do share it with me too.